This post is about behavioral change, particularly as it relates to health economics and the healthcare system. The essentials, the mechanics if you will, apply similarly to individuals, organizations, and the place of healthcare in general economy. The next couple of posts will be based on it and I'll likely refer to it many times in the future. Put your answers aside for a moment. We'll return to them shortly. Some of this may look fairly complex, but it's not really. Just follow it step-by-step and you'll see what's going on both in the post and, more importantly, you will see how trouble is inevitable or perhaps why we're already in trouble. So don't bail out on me quite yet. The economy grows and healthcare costs grow. When healthcare costs grow, premiums, employer burdens, and taxpayer burdens grow in parallel as well. Take a look at the following Chart 1, The Impending US Healthcare Crisis: Why it is Only a Matter of When: What do we see? We see economic growth E (with the random ups and downs taken out for simplicity). As is typically the case, it curves upward, representing exponential or compounding growth. We see D "$ at Some Percentage of the Economy" which parallels the economy itself. For example, this curve might represent 10 or 20 percent of the economy. Because it's a percentage, it grows at exactly the same rate as the economy. We also see H, Healthcare Spending. Note that, consistent with a lengthening history in the US, the rate of growth is faster than the economy (E) and faster than at $ at Some Percentage of the Economy (D). Because it grows faster, eventually it overtakes and crosses D at a point we have labeled "Decision/Behavioral Change Threshold." Then something changes. Now what might that "Decision/Behavioral Change Threshold" be? Let's return to the questions you answered at the beginning. (You did answer them didn't you?) Let's assume that you answered that at 15 percent of your family income you would have to drop coverage. Beyond that, regardless of the risk, it would be just too expensive to pay the monthly premiums. Your family circumstances and decision behavioral change are represented in Chart 1. Here's how. Your income is represented by Economy (E). Your 15 percent personal decision threshold is represented by "$ at Some Percentage of the Economy" (D). 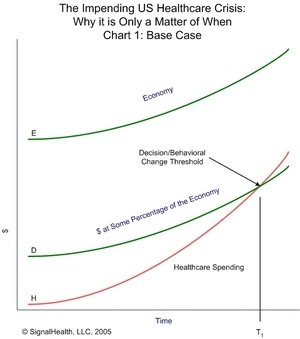 Premium growth is represented by Healthcare Spending (H). You drop coverage where the lines cross and at time T1. You may use the same chart to think of movement to more restrictive coverage. Assume that as the cost of coverage approached your 15 percent threshold (say at 12 or 13 percent), straining to maintain some form of protection, you might seek less expensive coverage. The chart will work in exactly the same way. 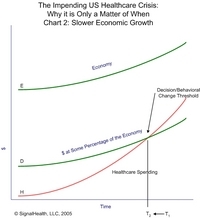 Now what happens if economic growth slows, healthcare costs accelerate, or you ability to devote a set percentage of your economic capacity to healthcare diminishes? 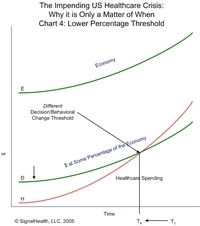 Chart 2 shows slower economic growth combined with healthcare cost growth the same as in the base case in Chart 1. 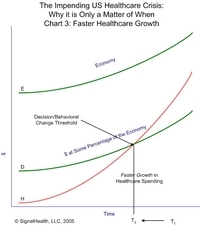 Chart 3 shows the base case economic growth and even faster healthcare cost growth. Chart 4 shows a lower Decision/Behavior Change Threshold. For example, if you would be forced to drop coverage at five or 10 rather than 15 percent of your family income as would generally be the case for lower income families, then the Threshold would be lower relative to the family Economy. What Charts 2 through 4 have in common is that all produce a change in behavior at an earlier time. Slower economic growth, faster healthcare cost growth, or a lower percentage of your economic resources that can be devoted to healthcare all cause you to drop coverage earlier. Pick your own markets of economic growth. Pick your own measures of economic capacity. Consider this at the most macro-economic level or at the personal level. The same effects result. If a system consistently grows faster than a larger system in which it resides, eventually an intersection is reached at which the behaviors of one or the other, or both change less the larger system be overwhelmed. But even being overwhelmed will generally yield a behavioral change (think uncontrolled cancerous cells overwhelming an organ or body and eventually killing it). What has been happening is that healthcare costs consistently outgrow the rest of the economy - which pays for healthcare. Increasingly individuals, families, employers, and governments capacity to carry the cost are being overwhelmed. So their behavior changes. In some cases, they seek increasingly stronger means of maintaining a financial relationship with the healthcare system. But in other instances, their behavioral change is to simply walk away. Thus, increasing numbers of uninsured. We don't all reach the intersection at the same time or at the same rate. The same is true for employers and governments. But, sooner or later, given the underlying structural relationships and dynamics, the vast majority of individuals and the economy overall will arrive at that intersection. Tennessee and other states arrived at it earlier this year with their Medicaid programs. General Motors appears to be at the doorstep right now. In contrast, for the time being, it appears that the Federal government has chosen to spend a higher portion of its economic capacity (tax revenue plus debt) on Medicare. Yet, when we consider projections for the Medicare Trust Fund, clearly the day of reckoning is not that far away. I'm going to make a brazen assertion here: If you want to understand what is happening in healthcare and if you want to anticipate what will be happening, then the single most important measurements to track are overall healthcare spending, the carrying capacity of the economy that's paying for it (whether family, regional, employer, governmental, or macro-economic), and their relationships to one another. With healthcare cost growth rates exceeding economic growth rates, the larger the gap between growth rates in healthcare spending and economic capacity, the closer the day of reckoning.